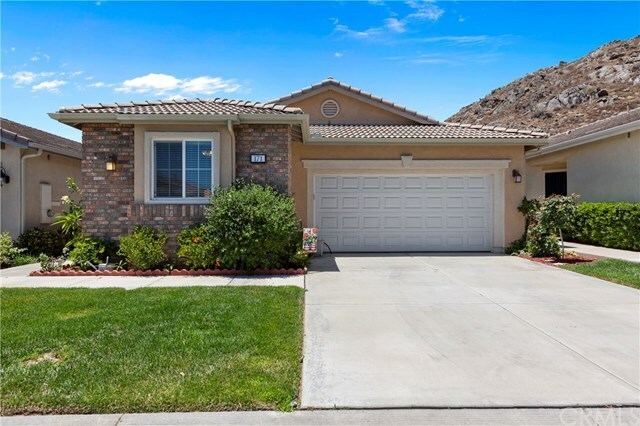 **Click on icon and Check out Virtual Tour**Welcome to Fabulous 55+ HEMET FOUR SEASONS, Guard-Gated Golf Course Community. 2 BED, 2 BATH, 1761SF HOME, situated in a culdesac. This home has pride of ownership inside and out! The moment you walk in the door you will be greeted with an open floor plan with well kept neutral carpet and tile. Kitchen has beautiful granite countertops with eat-at-bar, wood cabinetry, walk-in-pantry and refrigerator. Family room is open to dining area and adjacent to additional room that can be converted to an office. The two bedrooms are at opposite ends of the home, with their own bathrooms. Master is very large with dual sinks, walk-in-closet and shower. Other room is also generous in size with full bathroom nearby. Large inside laundry room with additional storage and close to the two car garage. Blinds and custom paint throughout. Enjoy your morning coffee off the patio with mountain views and manicured landscaping in a quiet setting. This Community has an awesome and active clubhouse that offers so much fun for everyone: Bistro, Ballroom, Movie Theater, Library, Computer room Billiard room, Craft room, Exercise room, Beauty shop, Cards. Outside offers: Pool and Spa heated all year long, Shuffle board, pickle ball, Walking, Biking, Tennis and much more. Why look anywhere else, when you can have it all in one location! Must see!